Position transducers convert mechanical motion into an electrical signal that may be metered, recorded, or transmitted. 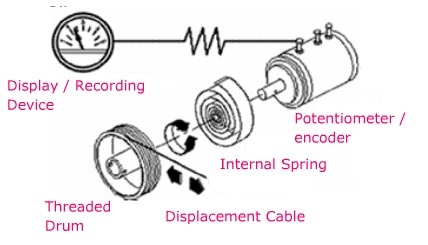 Position transducers consist of a stainless steel extension cable wound on a threaded drum that is coupled to a precision rotary sensor such as an incremental encoder, absolute encoder, hybrid or conductive plastic rotary potentiometer, RVDT, synchro, or resolver. Operationally, the position transducer is mounted in a fixed position and the extension cable is attached to a moving object. The axes of linear movement for the extension cable and moving object are aligned with each other. As movement occurs, the cable extracts and retracts. An internal spring maintains tension on the cable. The threaded drum rotates a precision rotary sensor that produces an electrical output proportional to the cable travel. The output is measured to reflect the position, direction, or rate of motion of the moving object.